Welcome to Antiques & Moore! 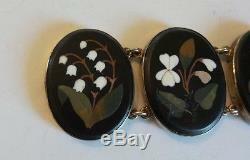 This listing is for a gorgeous antique Estate Pietra Dura (inlaid marble mosaic) flower bracelet made in Italy, c.
The bracelet is made with six Pietra Dura medallions each featuring a beautiful single inlaid flower of contrasting stone. Five of the designs feature white flowers and one features a lovely blue flower. The medallions are mounted into a gold filled bezel and attached together to form the bracelet with two chain links on each side. The bracelet measures 7" long with each medallion measuring 1 3/8" long and 1 wide. Total weight is 50 grams. 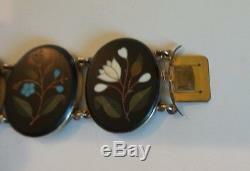 This nice bracelet is in very good to excellent Estate condition with no major damage or repairs. The first medallion (away from the clasp) has a tiny inlaid section of the stem missing and the medallion next to this one has the bottom section of the inlaid stem missing. There are no chips on any of the medallions with the inlaid colored stones in the design having bright colors. The gold filled mountings have expected patina and reflect minimal signs of normal wear. 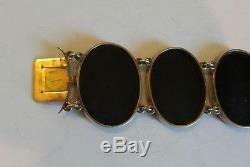 Overall the condition of this unusual bracelet is exceptional! We at Antiques & Moore have been in the Antiques business for over 30 years and try to describe our items as accurately as possible. We are happy to answer any questions and always appreciate your business! 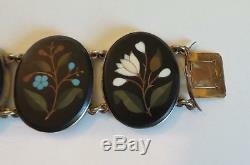 ANTIQUE ESTATE ITALIAN PIETRA DURA MOSAIC FLORAL 7 BRACELET, 50 grams" is in sale since Sunday, April 9, 2017. This item is in the category "Antiques\Periods & Styles\Victorian".